During the middle of summer, even the most discerning sun lover will be ready for a sheltered reprieve. 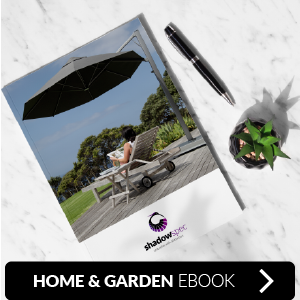 Transforming your outdoor space, garden, patio or deck with an umbrella is the perfect solution to creating a sheltered area, but where do you even begin when it comes to selecting which umbrella will be best? 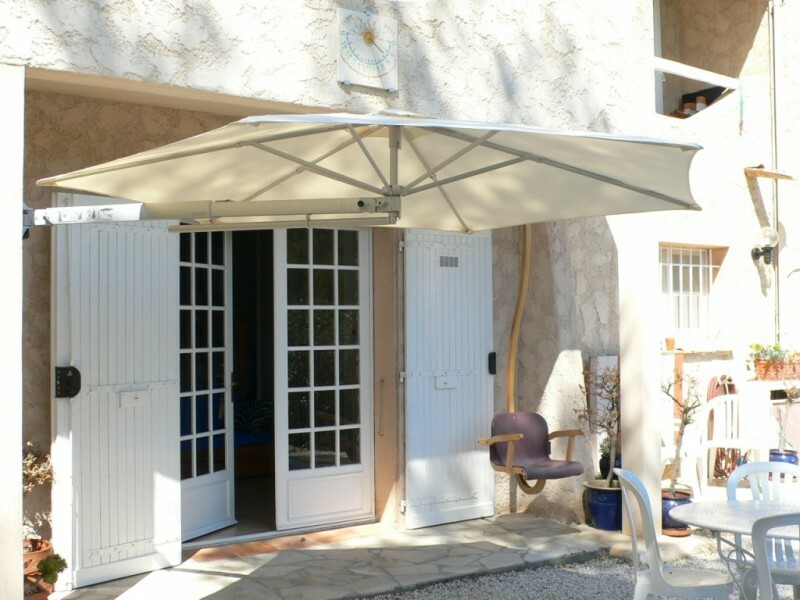 Where is the best place to put my outdoor umbrella? The first thing you’ll need to consider is where you’d like to place the umbrella. Do you have a flat surface for the umbrella to sit on (such as a deck or patio), or will the umbrella be wall-mounted? Also consider factors such as the location of the umbrella in relation to your house’s roof or overhang, is there enough space for the umbrella without it touching the roof? Another important factor is making sure your umbrella is not near any potentially damaging open flames from your BBQ or outdoor kitchen grill. What size outdoor umbrella should I buy? The amount of shade and shelter you get will be determined by the size of umbrella you choose. Think about how much shade you want, and how much space you have available. Placing an oversized umbrella into a small area will make your outdoor space rather uncomfortable, and placing a too-small umbrella won’t provide sufficient shade. Ideally, your outdoor umbrella should be table width plus an extra two feet per side if possible. Not all outdoor umbrellas offer protection from the sun’s rays, so be sure to check the UV protection factor of the fabric when making your selection. 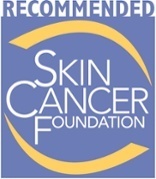 All of the Shadowspec umbrellas are made from Sunbrella fabric, which is UV resistant and also carries the Skin Cancer Foundation seal of approval (Click here to read more about the Sunbrella fabric). Also consider the warranty on that fabric, does it accurately reflect the quality and potential longevity of the umbrella? All Shadowspec outdoor umbrellas are manufactured from premium grade, non-corrosive materials and marine-grade fabrics. They are engineered, wind tested and certified to guarantee exceptional quality and top performance for many years. Wind resistance is also an important aspect to factor in. Will your outdoor umbrella offer protection from windy days, as well as not blow away into the neighbour’s property at the first sign of a light breeze? Ensuring your outdoor umbrella is both sturdy and durable will play an important part in determining its lifespan when surviving the outdoor conditions. Traditional umbrellas were made with wooden poles and features, yet many umbrellas today tend to be aluminium. Aluminium is much more durable than traditional wooden umbrella poles, however wood offers higher density so tends to have more staying power during high winds. Aluminium is lightweight, making it easy to move around. It is also powder coated to make it rust resistant, so you won’t have to worry too much about weather related deterioration. Wooden umbrellas may potentially run the risk of warping, splitting, rotting, molding, mildewing or even splintering. 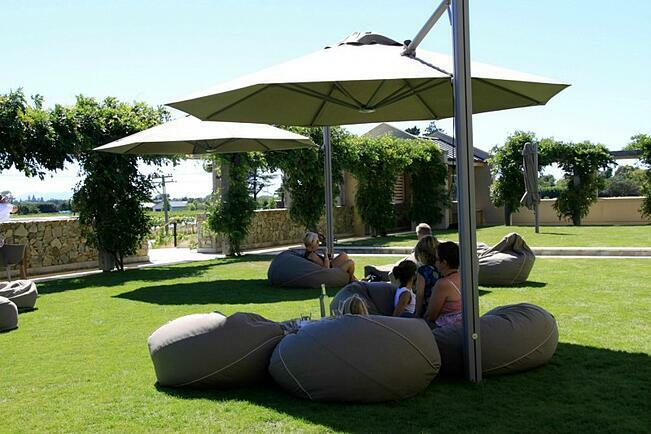 When selecting your outdoor umbrella, ensure it is easy to set up and take back down again. 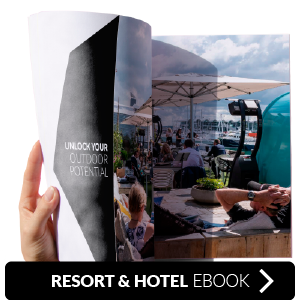 Be sure to check how the umbrella functions before purchasing it, most suppliers should have a video demonstrating the operation and use of the umbrella. If selecting an outdoor umbrella with a string or pulley based system, keep in mind that these can perish outdoors, leaving the opening system weak and brittle. 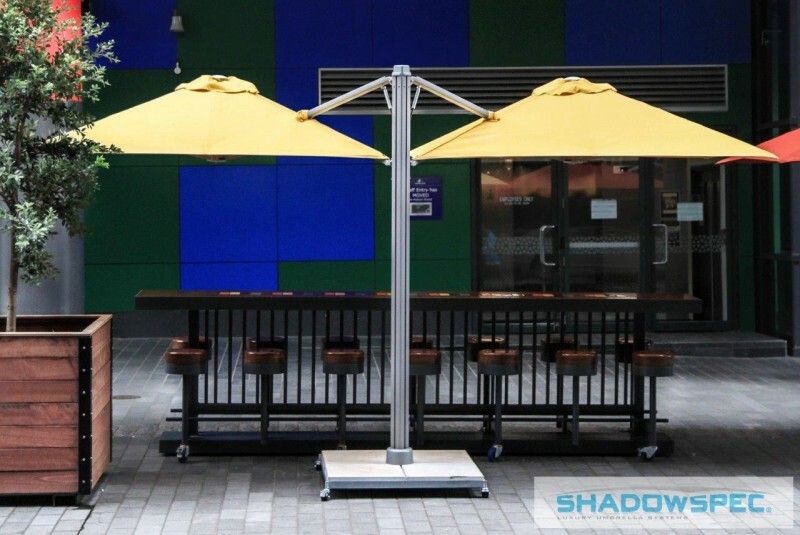 Shadowspec Umbrellas have no internal moving parts, internal cables or winding crank systems, which are typically the main culprits when it comes to hard-to-operate umbrellas. The international award winning, patented, ‘one easy sliding movement’ design for erecting and collapsing the umbrellas is also unbelievably easy to use and hassle free. Perfect for when you are low on space or have limitations as to the ground fixings you have available. These umbrellas are designed to be attached to a wall or pillar. 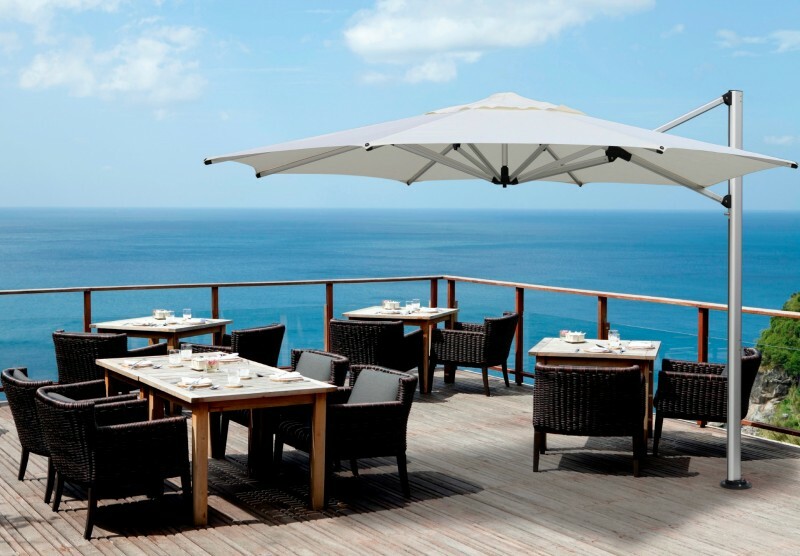 Centre pole umbrellas are perfect for table areas, and are traditionally the most common type of outdoor umbrella. The one piece pole sits in the centre of the of the table, or you can place outdoor furniture or loungers on either side of the pole. 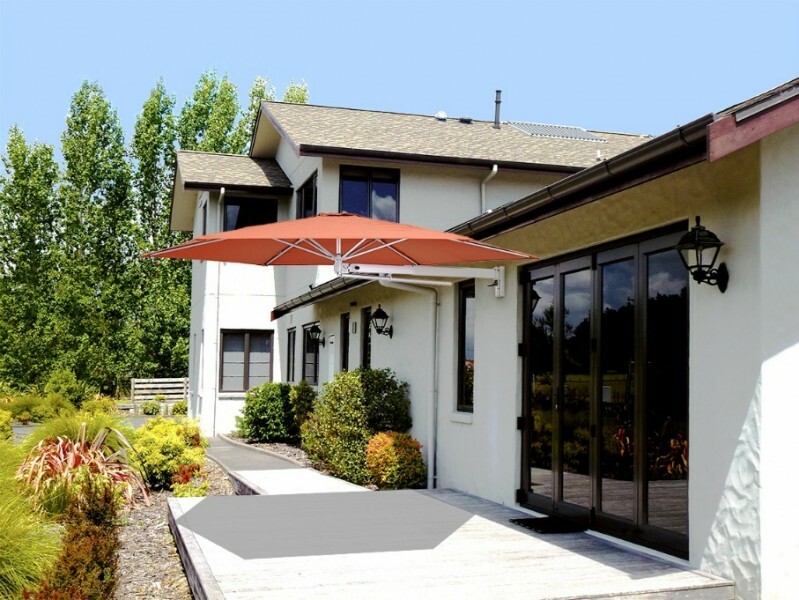 Cantilever umbrellas are quickly becoming the number one choice for most outdoor umbrella owners. 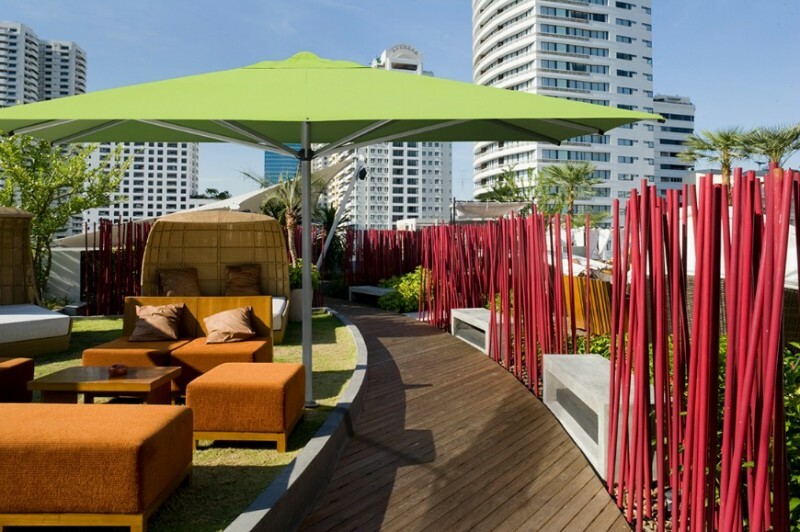 It is an elegant and practical option which offers shade away from the pole, allowing ease of movement under the canopy. 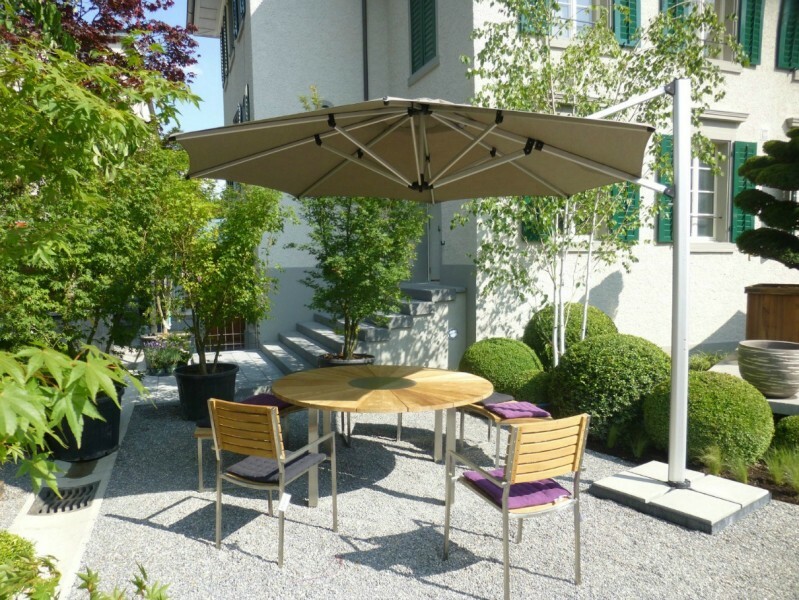 Having a sturdy base is one of the most important factors to consider when choosing an outdoor umbrella which isn’t going to be wall mounted. If your base is too light, the umbrella will easily topple over or fly away with the wind! This can be not only embarrassing, but potentially dangerous too (as well as becoming a tripping hazard if placed in the incorrect spot). Another solution with the umbrella base is to permanently fix the umbrella with bolts, or with a concrete ground fixing.